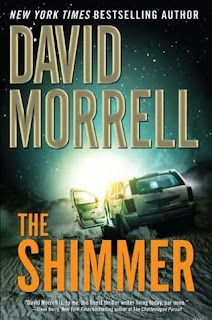 The fine folks over at FSB Associates offered me a book to review, David Morrell's The Shimmer. I am leaving the country in less than a week, however, for an extended trip to India (I'll miss you guys, too!) and so won't be able to read it. Did this deter FSB? Not at all- they offered me the book to give away to a blog reader if I wish. So for those of you who are interested, read on! Frantic, Page follows her trail to Rostov, a remote town in Texas famous for a massive astronomical observatory, a long-abandoned military base, and unexplained nighttime phenomena that draw onlookers from every corner of the globe. Many of these gawkers—Tori among them—are compelled to visit this tiny community to witness the mysterious Rostov Lights. Without warning, a gunman begins firing on the lights, screaming “Go back to hell where you came from,” then turns his rifle on the bystanders. A bloodbath ensues, and events quickly spiral out of control, setting the stage for even greater violence and death. This giveaway will be open until 2pm (CST) on Friday, August 21nd. As the book will be mailed directly from FSB Associates, this giveaway is only open to residents of the United States. Apologies to my international visitors! To enter, just comment on this post and tell all of us what unexplained phenomenon- be it shimmering lights, Stonehenge or black holes- really intrigues you and why. Also, please post your e-mail address so that you can be contacted. I will take all responses and pick one at random through a random number generator. Readers familiar with my fiction know how much I love doing research. For Testament, I enrolled in an outdoor wilderness survival course and lived above timberline in the Wyoming mountains for 30 days. For The Protector, I spent a week at the Bill Scott raceway in West Virginia, learning offensive-defensive driving maneuvers, such as the 180-degree spins you see in the movies. I once broke my collarbone in a two-day knife-fighting class designed for military and law enforcement personnel. Two years ago, I began the longest research project of my career. I was preparing to write a novel called The Shimmer, a fictional dramatization of the mysterious lights that appear on many nights outside the small town of Marfa in west Texas. When the first settlers passed through that area in the 1800s, they saw the lights, and people have been drawn to those lights ever since, including James Dean who became fascinated by them when he filmed his final movie Giant near Marfa in 1955. The lights float, bob, and weave. They combine and change colors. They seem far away and yet so close that people think they can reach out and touch them. In the 1970s, the citizens of Marfa organized what they called a Ghost Light Hunt and pursued the lights, using horses, vehicles, and an airplane, but the lights had no difficulty eluding them. Because an airplane was used, I decided to include one in The Shimmer. I'd never written about a pilot, and the idea of trying something new always appeals to me. The dramatic possibilities were intriguing. But a minute's thought warned me about the monumental task I was planning. As a novelist version of a Method actor, I couldn't just cram an airplane into my novel. First, I would need to learn how airplanes worked so that real pilots wouldn't be annoyed by inaccuracies. Real pilots. That's when I realized that it wouldn't be enough to learn how airplanes worked. I would need to take pilot training. I live in Santa Fe, New Mexico. Our small airport has a flight school: Sierra Aviation. I made an appointment with one of the instructors, Larry Haight, who took me up in a Cessna 172 on what's called a "discovery" flight. The idea was to "discover" whether I enjoyed the sensation of being in the cockpit and peering several thousand feet down at the ground. Flying in a small aircraft is a much more immediate and visceral experience than sitting in the cabin of a commercial airliner. Even in a Cessna, the canopy is huge compared to the tiny windows on an airliner. The horizon stretches forever. It turned out that I more than enjoyed the experience. It was exhilarating and fulfilling. I realized that this was something I wanted to do not only for research but also to broaden my life. As a consequence, I eventually earned my private pilot's license and bought a 2003 172SP. The plane was based near Dallas, and my longest cross-country flight to date (600 miles) involved piloting it from there to Santa Fe. Truly, nothing can equal controlling an aircraft, making it do safely whatever I want while seeing the world as if I were an eagle. In The Shimmer, I wanted the main character's attitude toward flying ("getting above it all") to help develop the book's theme. The following passage shows what I mean. You only need to know that Dan Page is a police officer. When I started pilot training, I figured that one day I'd be relaxing in the sky, listening to an iPod and glancing dreamily around. As we learn in this section, the actuality is quite different and more substantial. "Non-pilots often assumed that the appeal of flying involved appreciating the scenery. But Page had become a pilot because he enjoyed the sensation of moving in three dimensions. The truth was that maintaining altitude and speed while staying on course, monitoring radio transmissions, and comparing a sectional map to actual features on the ground required so much concentration that a pilot had little time for sightseeing. "There was another element to flying, though. It helped Page not to think about the terrible pain people inflicted on one another. He'd seen too many lives destroyed by guns, knives, beer bottles, screwdrivers, baseball bats, and even a nail gun. Six months earlier, he'd been the first officer to arrive at the scene of a car accident in which a drunken driver had hit an oncoming vehicle and killed five children along with the woman who was taking them to a birthday party. There'd been so much blood that Page still had nightmares about it. "His friends thought he was joking when he said that the reward of flying was 'getting above it all,' but he was serious. The various activities involved in controlling an aircraft shut out what he was determined not to remember. "That helped Page now. His confusion, his urgency, his need to have answers -- on the ground, these emotions had thrown him off balance, but once he was in the air, the discipline of controlling the Cessna forced him to feel as level as the aircraft. In the calm sky, amid the monotonous, muffled drone of the engine, the plane created a floating sensation. He welcomed it yet couldn't help dreading what he might discover on the ground. " At one point a character asks Page, how high he intends to fly. "Enough to get above everything," he answers. "Sounds like the way to run a life." That's an important lesson I learned from flying. thanks for this great giveaway. David Morrell is a great author and his books are unique and riveting. Living where I do the lights intrigue me greatly since they add a new dimension to the already endless skies. Crop circles! They always get me. I mean, what are they all about? I once heard about this team of researchers that constructed a flying machine out of materials that would have been available to Native American populations. This could explain why crop circles were made/viewed/etc! Like whoa. I would have to say that I am really fascinated by the Northern Lights. Not only are they mysterious, but they are also beautiful. I would love to be entered in this giveaway, and thanks for hosting it! I don't want to enter but I did just want to wish you safe and happy travels! Oh, I forgot to say, I love ghosts and the supernatural. If you could, I'd really like to be entered in this giveaway. Has to be the Bermuda Triangle. Couldn't pay me to cross that section of the ocean. Please enter me!! I am intrigued by haunted houses/buildings. Not that I would want to spend any time in one, but I enjoy reading about them. Taos Hum. A pervasive and persistent low frequency humming noise that only a few people are able to hear. Microphone's can't pick it up and the sound is hard to localize. Even when they do give it a location such as Taos, New Mexico they can't pinpoint the source of the hum. It's fascinating to me as I'm deaf. I wonder if with my absence of hearing I would be able to pick up the low vibrations of the hum. It's also frightening to wonder if it isn't some kind of countdown, ancient machinery or even supernatural reason behind the hum. Low frequency noises have been known to send subliminal message or hypnotize someone. Those huge heads at Easter Island...all that effort..Why? How? Please enter me. I would love to read this. I am fascinated by a great many things. But the one thing that most intrigues me would be Stonehenge. Many theories, but none confirmed. Forgot to leave my e-mail, duh. Wow - what a great post, book and fun question :)!!! I know you are already gone to India, but if you read this while you are over there, I'd love to know where in India you are at! I am going to Mumbai and Pune at the end of September for 1.5 weeks.